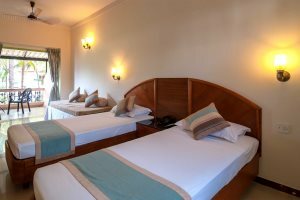 Ideally located close to the beach, this welcoming resort is perfect for those in search of a good value for money Goa holiday. The hotel is just a short stroll to the sandy beach at Betalbatim where there’s a selection of beach shacks to sample. The swimming pool is a suntrap, ideal for topping up your tan. Just a 20-minute walk away is the village of Colva, where you’ll find a good selection of shops, bars and restaurants. Set close to the beach in Betalbatim, South Goa, Nanu Beach Resort offers guests a relaxing and tranquil base from which to enjoy a holiday in Goa. 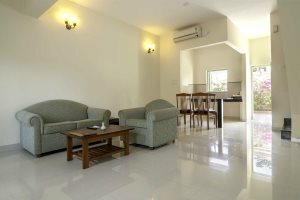 Consisting of a collection of pretty, white-washed villas surrounded by well-kept, flourishing gardens, make your way through the grounds to the welcoming pool, where you could choose to soak up the sun, take a refreshing dip, sip on your favourite beverage or perhaps get lost in a good book, the choice is yours. 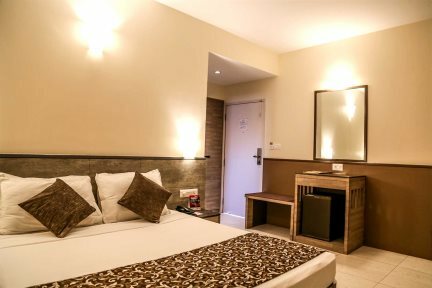 Decorated in simple yet classic fashion, the rooms at Nanu Beach Resort provide a comfortable base, presenting the feel of staying in a Goan village. The guest rooms are located within the villa buildings, and are all positioned within the mature grounds, providing vistas of greenery or the pool area. You can make the most of the pool-side bar and coffee shop during the day, sampling fruity cocktails, aromatic coffee and tasty pastries. By night, explore the authentic local cuisine, continental favourites or fresh seafood, which is all sure to make your mouth water. For a change of scenery, you’ve also got the beach shacks along the sand, offering fresh dishes to further explore the best of Goan cuisine. The resort’s setting in South Goa is in a wonderful location to do some beach hopping and exploring of the local villages and resorts. Not too far away you’ll find Majorda and Utorda beaches to the north, and Colva and Benaulim beaches to the south. The capital, Panjim, is also around 30km away should you wish to explore more of Goa’s unique heritage. Deluxe Rooms feature an individual balcony overlooking garden and the pool and are located on the first or ground floor. Premiere Rooms feature an individual balcony overlooking garden and the pool and are located on the first floor. Villas feature a large air-conditioned lounge area on the ground floor and a bedroom on the first floor with a large balcony overlooking the gardens and the pool area.